Sometimes, the heating bill starts to climb in the winter and all of the other winter taxes like holidays and a sudden potential need for new snow tires take precedence over the ever-climbing heating bill. So how do you lower the heating costs alongside the possibility of your heater suddenly giving out because of overuse after many seasons? Get smart about how you use it. You might not need a 30-degree temperature difference between the inside of your home and the outside temp if you use a couple of clever tricks to keep the bill down and your tootsies nice and cozy. We aren’t suggesting that you wear your Elmer Fudd hat indoors, we’re merely suggesting that you avoid wearing daisy-dukes and a muscle tank indoors. Winter is invariably cozy and warm, so there’s no reason not cuddle up under your favorite blanket with a book or some spooky movies and stay warm. We recommend sliding on those fuzzy socks you’ve been saving up and slipping into your favorite hoodie or sweater. That’ll keep the room feeling nice and warm without costing you an arm and a leg. Start with some good old flannel sheets for your bed. There are even some extra fuzzy ones that you can invest in that will keep your bed nice and warm. If you’re not seeing results for keeping warm at night from that alone, go a little medieval. We aren’t suggesting you get a pan full of hot coals and stick it between the duvet and the sheets. Merely warm up a couple of rice packs and slide them deep inside the sheets down by your feet. That’ll keep your tootsies warm which are actually a major part of your body’s temperature regulation. Take it a step further and pop open those curtains as soon as the sun up. Your windows will maximize the heat from the sun. Shutting those curtains as soon as the temperatures fluctuate and get colder in the night will trap all that sun’s heat inside the home. If it’s the opposite for you and you’re not so worried about the bill, you’re more worried about keeping your larger house warmer, you might look to some of the appliances you have around the house. For example, you have a couple of different kinds of fans in your house. Use less of the fans above your oven and in your bathroom and start using those ceiling fans. Oftentimes your house will start to feel colder because all of the warm hair has risen to the top. Stirring it around will filter it back down around to keep you and your family warm. If you find that your furnace is leaving a lot to be desired, you might consider a simple solution: changing the filter. If your energy bill is climbing and your house is staying cool, it’s probably the furnace filter. Your furnace pump will need to go extra hard to push the heat around your house. When it’s in use, we recommend changing the filter around once every month, or else you’ll see some pretty scary numbers no that utility bill. Trying to find a heating solution is sometimes as simple as calling the professionals. If you’re hoping to lower your heating bill or just trying to get the last few years of life from your current heater, we can help. With a well-placed repair or a high-efficiency heater replacement solution you might find your heating bill drops considerably. 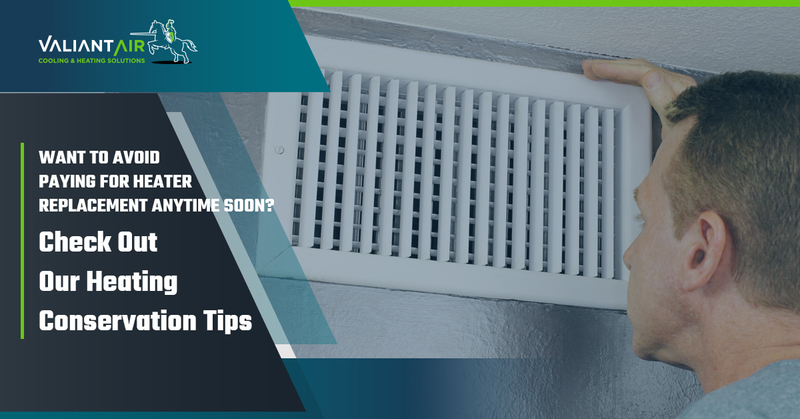 Interested in a few more tips to take all the work off of your heater? Catch our next blog to get a peek at a few more heating solutions.